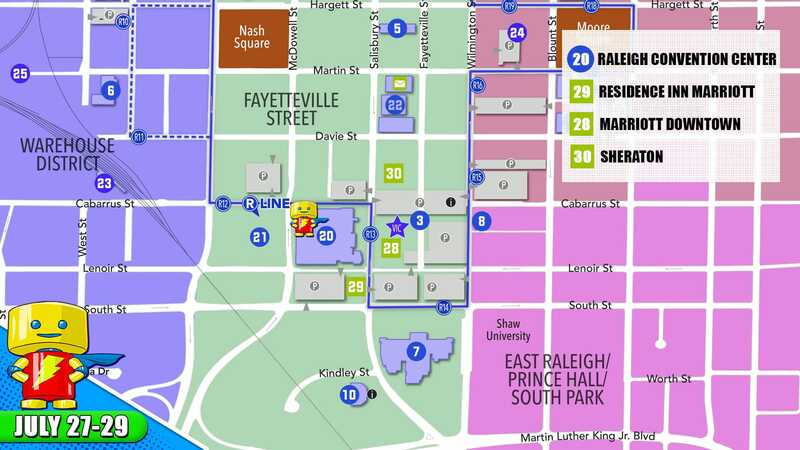 Click here for a detailed map of Downtown Raleigh from Visit Raleigh. The Raleigh Convention Center is located in the heart of Raleigh, NC and is located adjacent to the Red Hat Amphitheater. There are Public Parking garages on Lenoir Street between Salisbury and McDowell Street, one on McDowell Street between Cabarrus and Davie Street, and one on Salisbury Street between Cabarrus and Davie Street. For more information on ADA Accessibility, click here. Click here for detailed parking information from the City of Raleigh. Take exit 298B South Saunders Street toward Downtown Raleigh. Turn right onto South Saunders Street. Stay in the right hand lane. South Saunders splits and the right lanes become McDowell Street. Turn right onto Lenoir Street. Raleigh Convention Center will be on the left. Entrance to parking is the second right after the turn onto Lenoir (Performing Arts Center Deck) OR one block ahead on Lenoir on left (Raleigh Marriott City Center Underground Garage). Take exit 81 to merge onto I-40 West toward Raleigh. Take exit 298B South Saunders Street toward Downtown Raleigh. Turn right onto South Saunders Street. Stay in the right hand lane. South Saunders splits and the right lanes become McDowell Street. Turn right onto Lenoir Street. Raleigh Convention Center will be on the left. Entrance to parking is the second right after the turn onto Lenoir (Performing Arts Center Deck) OR one block ahead on Lenoir on left (Raleigh Marriott City Center Underground Garage). From US 1 North take exit 1A to merge onto I-40 East. Off I-40 East, take exit 298B South Saunders Street toward Downtown Raleigh. Turn right onto South Saunders Street. Stay in the right hand lane. South Saunders splits and the right lanes become McDowell Street. Turn right onto Lenoir Street. Raleigh Convention Center will be on the left. Entrance to parking is the second right after the turn onto Lenoir (Performing Arts Center Deck) OR one block ahead on Lenoir on left (Raleigh Marriott City Center Underground Garage). Take US 70 West toward Clayton. Take ramp onto I-40 West toward Raleigh. Take exit 298B South Saunders Street toward Downtown Raleigh. Turn right onto South Saunders Street. Stay in the right hand lane. South Saunders splits and the right lanes become McDowell Street. Turn right onto Lenoir Street. Raleigh Convention Center will be on the left. Entrance to parking is the second right after the turn onto Lenoir (Performing Arts Center Deck) OR one block ahead on Lenoir on left (Raleigh Marriott City Center Underground Garage). Take US 1 South into Raleigh. US 1 becomes Capital Blvd. coming into town. Stay on Capital Blvd., crossing over I-440 beltine. Capital Blvd. becomes Dawson Street as you approach downtown. Go 9 blocks south on Dawson Street. Turn left onto Lenoir. Cross over McDowell Street and Raleigh Convention Center will be on the left. Entrance to parking is the second right in the Performing Arts Center Deck OR one block ahead on Lenoir on left (Raleigh Marriott City Center Underground Garage). US-64 West becomes New Bern Avenue. Cross over I-440. New Bern Avenue becomes Edenton Street. Go 1 mile on Edenton Street and turn left onto Salisbury Street at the State Capitol. Raleigh Convention Center is 7 blocks south on the right. To enter parking, go past Raleigh Convention Center and turn right onto Lenoir Street, Performing Arts Center Deck is on the left OR turn left onto Lenoir Street, entrance to Raleigh Marriott City Center Underground Garage is on the left. Take Glenwood Avenue east (US 70E) toward downtown. At end of Glenwood, turn left onto W. Morgan Street. Turn right onto S. Salisbury Street. Raleigh Convention Center will be ahead on the right. 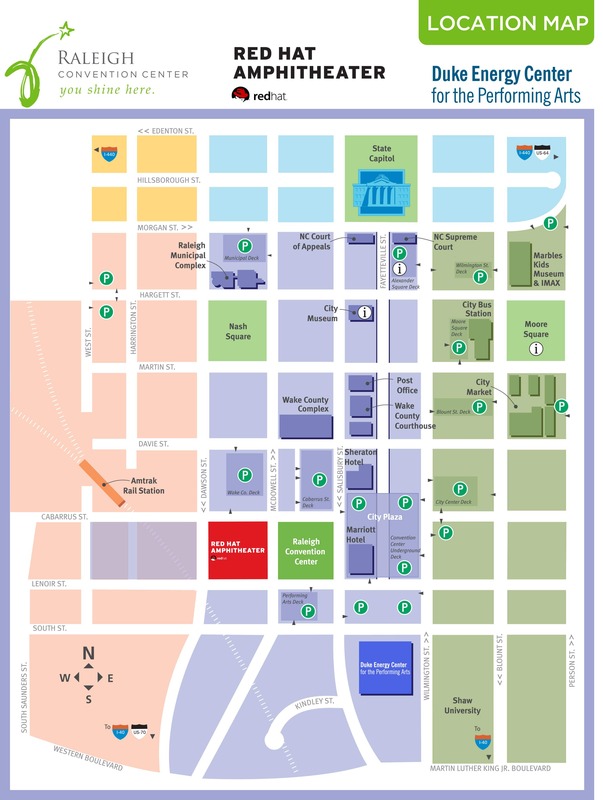 To enter parking, go past Raleigh Convention Center and turn right onto Lenoir Street, Performing Arts Center Deck is on the left OR turn left onto Lenoir Street, entrance to Raleigh Marriott City Center Underground Garage is on the left. Take the US-64 West/I-440 E exit toward Benson/Durham/I-40. Merge onto I-440S/US-64W. Take exit 298B South Saunders Street toward Downtown Raleigh. Turn right onto South Saunders Street. Stay in the right hand lane. South Saunders splits and the right lanes become McDowell Street. Turn right onto Lenoir Street. Raleigh Convention Center will be on the left. Entrance to parking is the second right after the turn onto Lenoir (Performing Arts Center Deck) OR one block ahead on Lenoir on left (Raleigh Marriott City Center Underground Garage).